I recently came across this article about the Starforce copy protection system that silently installs on Windows when you install any of the games (and some demos) listed at the bottom of this post. People have stated that this software is akin the Sony's XCP protection and can potentially expose your computer to viruses and hackers and may break your DVD Rewriter. I found it installed on my system as a set of hidden drivers, likely when I installed Egosoft's X2 - The Threat (see device manager screenshot). When people complain to Egosoft they say its not their problem, that its the publisher that decided to use it, so users should complain to them. What BS. Why is it our problem to fix their product?! That's their publisher not ours, and its their software, ergo its Ego's problem, or will they only notice when it hits sales? 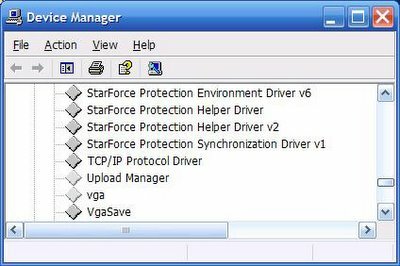 (Note Egosoft are just one of many companies using Starforce, I'm singling them out because it is on my system because of their product). Publishers need to be made aware that treating their customers as thieves is not acceptable behaviour.